Minister of State, Joseph Harmon yesterday commissioned the multi-million-dollar Aruwai Whitewater Resort in the Cuyuni/Mazaruni area, the brainchild of Bartica gold miner, Chunilall Baboolall. Situated 15 minutes by Jet Ski from Bartica, Buck Track Island once housed the now defunct White Water Resort. It is situated at the mouth of the Mazaruni and Cuyuni rivers. The size of the island is approximately one quarter of a square mile. The resort features a 50-room hotel, while visitors will have access to the beach that surrounds the island. 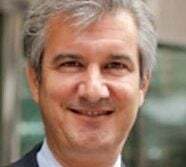 The investment figure has not been disclosed. Harmon, in a Ministry of the Presidency statement, said the opening could not have come at a more opportune time, since Bartica is scheduled to become Guyana’s first ‘green’ town, months away from the country’s 50th Independence Anniversary. “This resort in a very short time has transformed a small, insignificant island into a magnificent edifice. 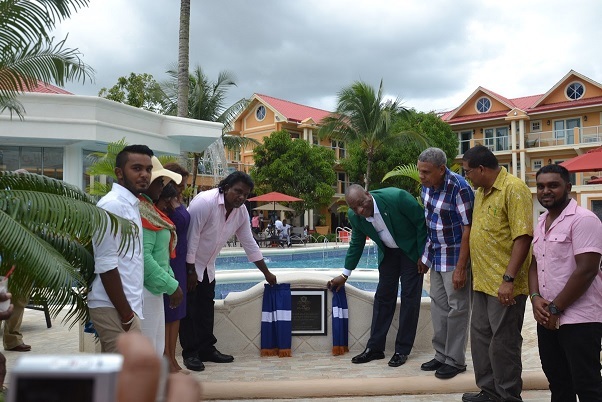 It truly comes at a time when Guyana has so many new beginnings politically and otherwise,” Harmon said, prior to unveiling the plaque and declaring open the resort. Harmon said that Baboolall should be considered as a true pioneer and his investment should be lauded and emulated. The investment will be a significant boost to the economy of Bartica since it will provide employment for many and earn revenue, he added. According to the release, Baboolall said he got the idea to build the resort after the price of gold started to fall. Work started on the structure four years ago. He praised his family for their support and at the same time called for government support. Minister of Tourism, Catherine Hughes, in her remarks said that the Government was proud of the achievement and was excited to see the benefits which would accrue from it. “It is absolutely fantastic to be here. This deserves a round of applause. In these times, you have to be committed to make such a huge investment and we in the tourism industry, in Guyana, recognise the import of the decision you have made and we thank you for adding quality and value to our tourism products,” Hughes was reported as saying. She added that the Government is ready to assist in whatever way it can to ensure that the tourism and hospitality sectors thrive. She said that from January 2016 the Government will be implementing a plan which will see Guyanese businesses especially those in the tourism sector, being able to benefit from various forms of governmental support. “We will unfold a massive marketing plan that will target Guyanese and those in the diaspora and those that come from the other countries….We have been working to ensure that they know about Guyana,” she declared. Head of the Guyana Tourism Authority Indranauth Haralsingh, also praised the initiative, stating that it is the definition of luxury and comfort. Currently, the Aruwai Whitewater Resort boasts 35 rooms, but once expanded and completed it is expected to have 50 luxurious rooms including a Presidential Suite, the release said. The infrastructure includes some of the essential appurtenances of a luxury resort including a pool, spa and gymnasium and also an airstrip on the property. Aircraft using the Bartica airstrip to fly to and from Aruwai will also benefit from a resurfaced access road to the Bartica airstrip which will also be financed by Baboolall. 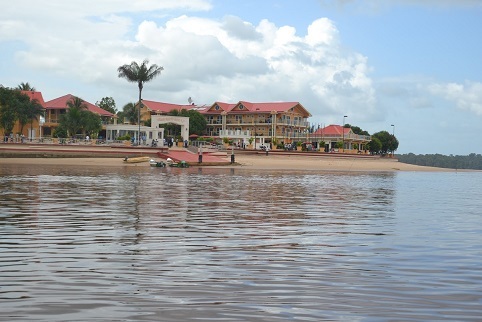 The perks accruing to visitors to the facility will include boat rides on the Essequibo, Cuyuni and Mazaruni rivers and visits to local mining camps. Visitors to Aruwai will also experience the White Water Falls as well as the Resort’s ‘Banana Boat’, the ‘Love Boat’ and the Jet Ski and water slide trampoline. Baboolall in an earlier interview with Stabroek News had said that the facility is being designed to facilitate elderly persons and that its inventory will include wheelchairs.